MainAll NewsInside IsraelDuma arson trial: Investigators ignoring suspect's alibi? Wife of primary suspect in Duma arson trial claims investigators ignoring her testimony validating her husband's alibi. An Israeli resident of Samaria suspected of sparking a fire that killed an Arab Palestinian family in 2015 had a clear alibi authorities chose to ignore, the suspect’s wife revealed in an interview. 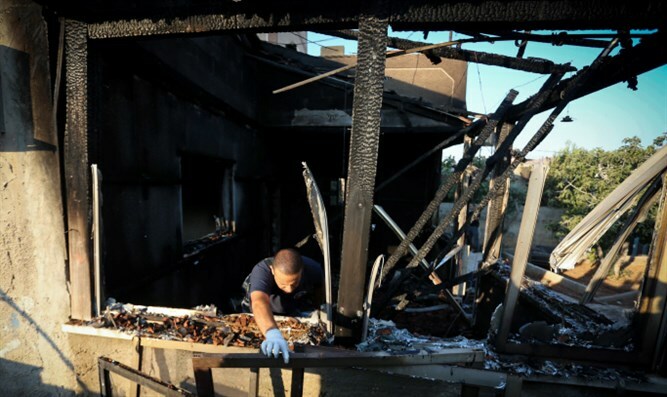 The wife of Amiram Ben Uliel, the chief defendant in the Duma arson case, provided the investigators with an alibi which they chose to ignore, journalist Yifat Erlich revealed following an interview with Orian which was published in the Yediot Aharonot Hebrew daily. In the interview, Orian Ben Uliel said that her husband was home with her the entire night of the arson attack in Duma. "It is impossible that he did this. That night, we went to sleep late, around midnight. When I got up at around 4:00 am, he was there and we had a conversation." "That morning, I went to drive a few girls who were at the summer camp in Geulat Tzion to a water spring. My friend had asked me to do this favor for her a few days before. We agreed that I would leave the baby with Amiram so that there would be more room in the car. I was afraid to do this, however, because my daughter was so attached to me. I nursed her. By five in the morning, I had already driven the first group of girls to the spring, and after that I made another trip. There are many witnesses who saw me without the baby. "I would never have left my baby alone. Amiram watched her. I then went to the grocery and on the way, I called him to make sure that everything was okay with the baby. " Interviewer: "Maybe he went out at night without your noticing?" "The indictment claims that he went out at 11:00 p.m., passed the cave where the second defendant, Elisha Odess, was sleeping at the settlement of Yishuv HaDa'at. He allegedly walked to Duma and back by foot. It is at least an hour and a half walk from there to Duma, and another hour and a half walk from Duma to Adei Ad where we lived at that time. He could not possibly have had the time to return from Duma to our house by 4:30 a.m. And besides, I would have heard if he had gone out. We lived in a [make-shift house built from a] truck in Adei Ad. The only way to open the door was to kick it open, and this made a screeching noise. There is no way he could have left without my hearing." Interviewer: Has anyone checked your claims? "I told all this to our lawyer. During the entire first month that Amiram was under arrest, the lawyer asked them to interrogate me. "But my evidence did not interest them. They tortured him without questioning me. They finally questioned me just before they filed a prosecutor's statement. I told them what had happened that night. I gave the name and phone of my friend who had organized the summer camp in the Geulat Zion and of the girls who were there. I do not think they did anything with it. It did not interest them. They were anxious to solve the murder and file an indictment." Journalist Yifat Erlich was not satisfied with Orian's testimony. She contacted Orian's friend, Sara Miriam Malet, a well-known activist in the settlements, who had organized the event." "Yes," said Sara Miriam, "I organized the Eretz Yisrael camp. A few days in advance, I had asked Orian if she could save that night to help me bring the girls to the spring in the early morning." In addition, late that night, she called Orian to remind her to get up early to give the girls a ride. "I heard her baby crying in the background, and Orian said, 'Wow, how can I get up so early in the morning?" Amiram was at home next to her, and I heard him ask Orian something. At about 4 a.m., I sent her a reminder and made sure she got up, and at five she had already made her first trip with the girls. "Orian left the baby with her husband to have more room in the car. She came without the baby. The baby was with her husband. " Interviewer: Did anyone called you from the police or the GSS to question you and verify the details? "No. No one talked to me." Uri Kirschenbaum, author of the Facebook page "The Duma Blood Libel," (“Alilat Duma”), who has been part of the struggle to exonerate Amiram, said, "It is tragic that a young woman should see her husband languishing behind bars only because the Shin Bet Security Service has managed, through torture, to force a false confession. "The distortions and scandals connected to the Zadorov case (who was convicted of the murder of Tair Raida but whose case is now being reviewed) are nothing compared to the horrors of the Duma story. We believe that slowly, as the Israeli public learns more about the torture that was used to force the defendants' confessions, this case will begin to unravel." Sunday marked the opening of the next stage of the Duma trial. During the first day, the hearing was closed to the public as the interrogators were being cross examined. The court also acquiesced to the objection of the Shin Bet (GSS) and the State Prosecutor's Office not to publish the minutes of the mini-trial in which GSS agents revealed the details of their prolonged torture of the defendants, which they called "necessary investigations." It should be recalled that the court dismissed the admissibility of most of the confessions made during the interrogations by Elisha Odess who was a minor, and some confessions of Amiram ben Uliel. The confessions were dismissed due to the fact that they were obtained under severe and unrelenting torture. There are two additional hearings scheduled in the trial, including one on Wednesday, December 12th and Sunday, December 16th, 9 a.m. at the central courthouse in Lod.